Are there alternative sites for a dog park if WMATA sells the 11th and Park parcel? 11th and Park Street parcel, which is now being used as a dog park. Image created with Google Maps. A version of this article was first published on the Park View, DC blog. 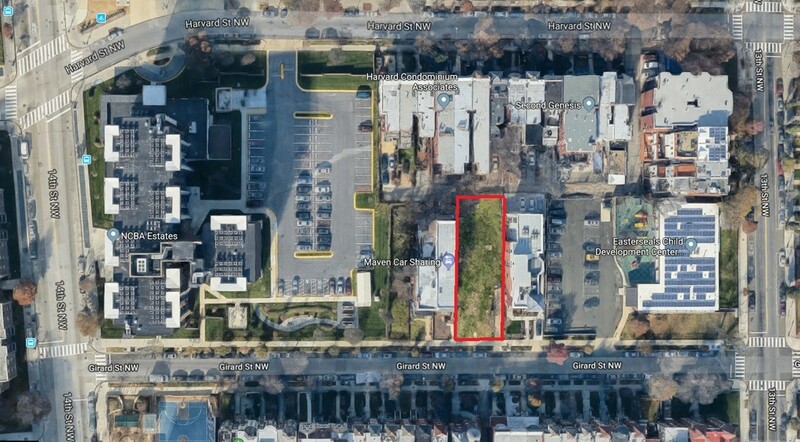 For much of 2018, intense focus has been on the parcel of land owned by WMATA at 11th and Park Road, which has been used as an unofficial dog park since 2009. After many attempts by residents to convert the site into a permanent dog park, WMATA indicated that it was considering selling the parcel. In response, Ward 1 Councilmember Brianne Nadeau secured $1.5M in the District budget to purchase the property for the specific use as a dog park. However, the amount fell short of WMATA’s estimate of $2.1M. WMATA put its site at 11th and Park Street, NW, on the open market in early January, 2019. In early January 2019, WMATA officially put the land on the open market, and while the District is still welcome to put a bid on the property, all bidders can put their best offer forward. The issue of the dog park’s sale was discussed at the January 9, 2019 meeting of ANC1A, and Nadeau was there to answer questions. Nadeau stated clearly that any support from the ANC requesting Mayor Muriel Bowser to put forth a fair price offer to purchase the site would be helpful. Nadeau also shared that she had informed the Mayor not to get into a bidding war or to buy the property at any cost. By a split vote, the ANC voted to send notice to the Mayor requesting that she make a fair market offer for the property. Considering these events, there is a good chance that the property may be sold to a private developer. As one of the local ANC commissioners, I've been asked on several occasions what options may exist for a dog park other than the current site at 11th and Park. To have that discussion, it is critically important to understand what parcels currently exist that could be used for expanding the area’s recreation potential. Here's a list of the top five sites that immediately come to mind, or that have been mentioned to me. Keep in mind for comparison that the 11th and Park site is approximately 8,046 square feet of raw space. 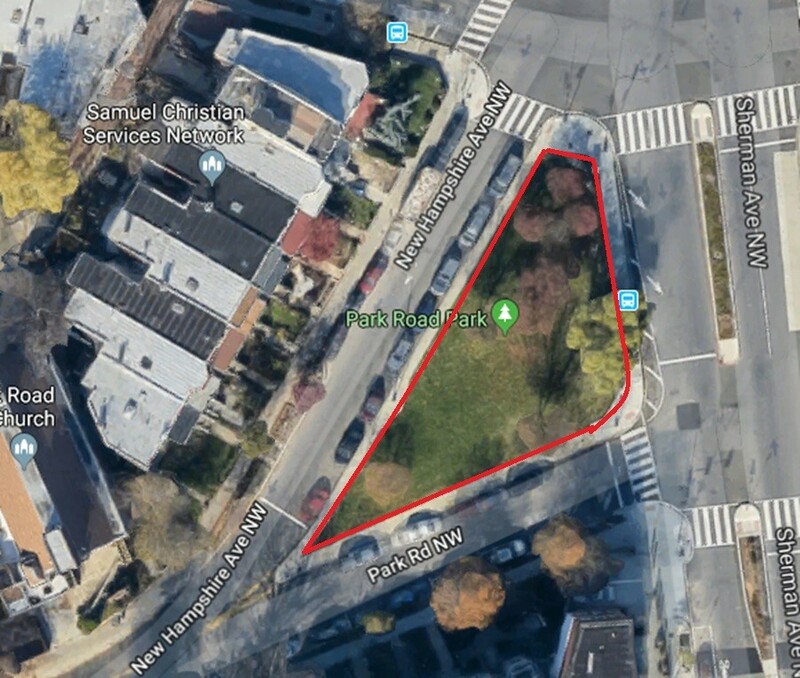 If developed into an official dog park, the usable land area is approximately 6,500 square feet, due to the WMATA infrastructure that needs to be maintained. The Park Road Park is commonly referenced in any discussion of alternative dog park sites. 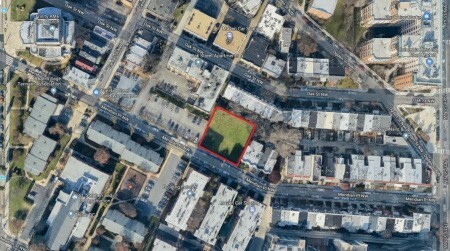 As a triangle park in DPR’s inventory, it isn’t land that will be developed. It's already owned by the District and it has approximately 8,505 square feet of usable land, which are also pluses. However, it is also used for neighborhood block parties and events from the Park Road Community Church every now and then. Some dog owners also currently use the triangle park as part of their daily walks in addition to—or instead of—stopping by the current dog park. Nearby neighbors have been and are likely still opposed to the site being dedicated entirely to a dog park, rather than open to multiple uses. Of the sites in this brief survey, this is the one that excites me the most. While it is a quirky site located to the northeast of Raymond Elementary and Raymond Recreation Center, it is publicly-owned land that really has no other use. 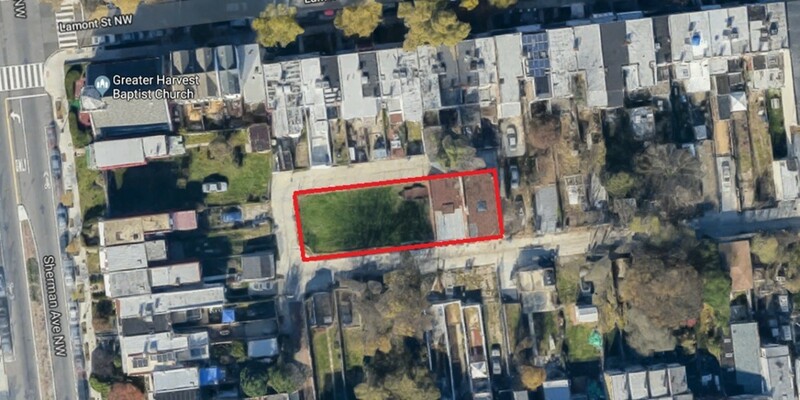 Like the Park Road Park, it is currently owned by DC with a small section that is Federally owned and it has 8,439.6 square feet of space. It is next to a staffed DPR facility which could help with maintenance. I’ve also noted that some neighbors already use the front lawns of Raymond for their dogs, and it might be nice to actually create official facilities here. On the down side, it is located in ANC4C and Ward 4, though just over the border, and would require cross-community collaboration. A site visit also shows that the current space would need a retaining wall and to be regraded to function as a dog park, but a project of this scale could also include inefficiently used and unused asphalt areas of the parking lot increasing the space to at least 9,500 square feet, making this site the one with the potential for the largest park. These issues noted, it would create a dog park on public land that has no other real use—this is as close to a win-win as any alternative site can get. The construction of a retaining wall and surface regrading could result in an 8,500-9,500 square feet dog park at the Raymond Rec and School site. Image by the author. The Raymond Rec and School site. Image by the author. All privately owned properties have the added complexity of requiring the sale of land, which the owners may not be interested in doing. The next three sites could work, but may not actually be available. I’ve been fascinated by this double alley lot for a while. It is at the west end of the block bordered by Sherman, Lamont, Georgia, and Kenyon streets. The lots themselves are surrounded on all four sides by alleys. The site is smaller, being 6,051 square feet, and some of the existing buildings were likely originally a stable for horses. Alley lots are hard to develop, despite how they are zoned. Because of this, I’ve long felt that the District should buy this to add to DPR’s portfolio, if not for a dog park perhaps for a community garden. It clearly has neighborhood potential in a number of ways. The vacant parcel on the north side of Girard Street between 13th and 14th streets is another possibility. It is 7,463.9 square feet in size and was originally the home of Dorothy Brizill and Gary Imhoff until a fire gutted the house in May 2012, leading to the property being cleared and vacant. The property is currently behind on its taxes, so perhaps there would be interest in selling it to the District for a public purpose. This last one is a bit of a stretch. While it is comprised of 7,483.5 square feet of useable land, it is zoned RA-2 which allows more density and makes it more desirable for housing. That would also translate into a higher asking price, which is part of the issue with the WMATA site (which is zoned MU-4). 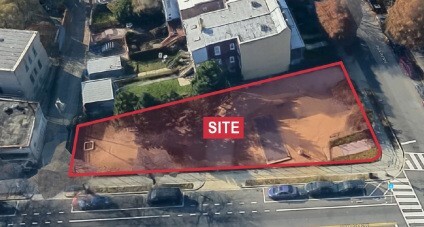 This parcel is owned by Trinity Property Holding Corporation of Washington (Trinity AME Church) along with the nearby parking lots, originally purchased for the goal of creating housing. 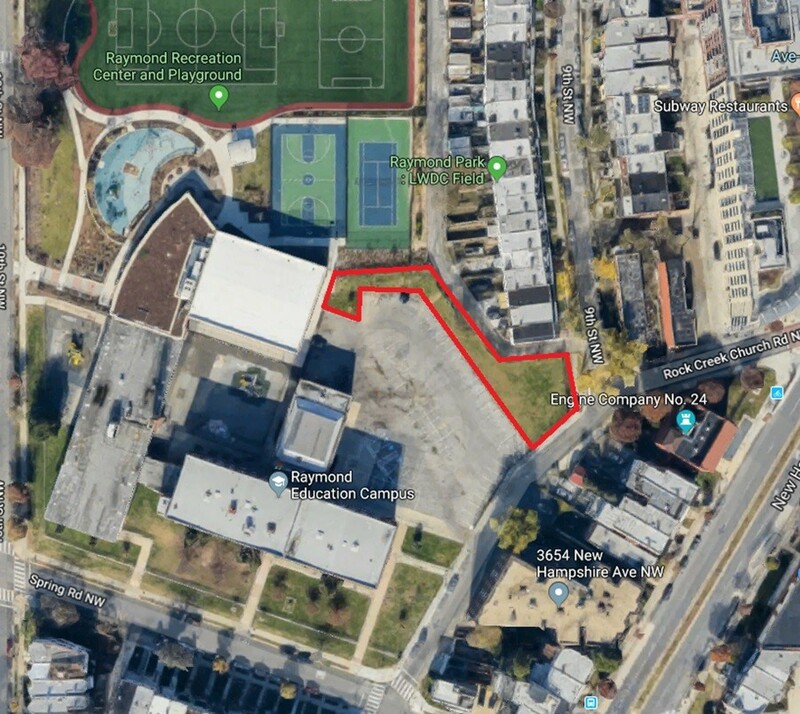 While these sites could be used to create a permanent dog park in the Columbia Heights community, there may be other options as well. Do you have a suggestion to add to this list? If the District is buys the 11th and Park WMATA property, do you think they should pursue any of these sites for other uses?